Check out my new flash archive viewer… it makes it easy to browse the strip from the beginning and zip through it. I also made Soapy Pong a little more user friendly… if you go here you can play soapy pong at the size of your browser window. 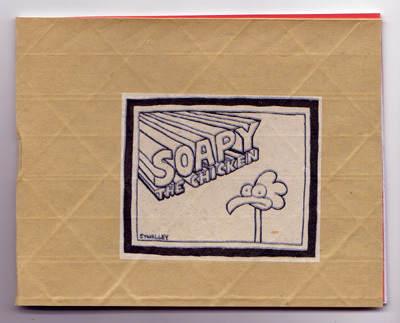 The highest score in Soapy Pong in the next couple weeks wins a copy of the Soapy the Chicken mini-comic with hand screenprinted covers I mentioned the other day delivered to you by an actual employee of the United States Postal Service. Send me your address and a .jpg screen capture of your high score to me at mrmonkey23 at hotmail.com to enter. Deadline for entries is midnight on April 13th. No cheating please. 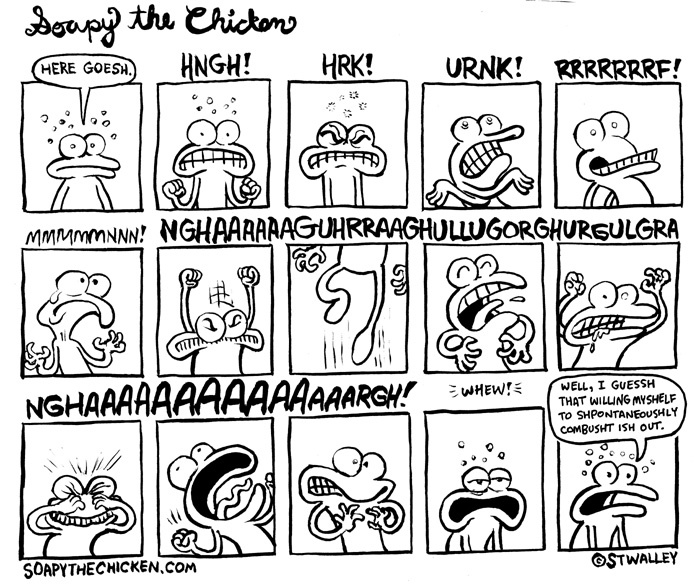 Pictured above is the cover to the first Soapy the Chicken mini-comic… I printed up around 230 of them, and the front cover and inside covers are all screen printed by hand. 150 of them went into boxes tonight for Lutefisk Sushi Volume B, which is premiering this Friday in Minneapolis. Charles Schulz is dead, leaving many Minnesotans to believe their cartoon heritage lives on in lawyers squabbling over the rights to Camp Snoopy and hideously-painted giant-sized character figurines. Chin up Minnesota! Our state’s cartoonists labor on, without litigation! Without theme parks! Without money! Without dignity! Without pants! 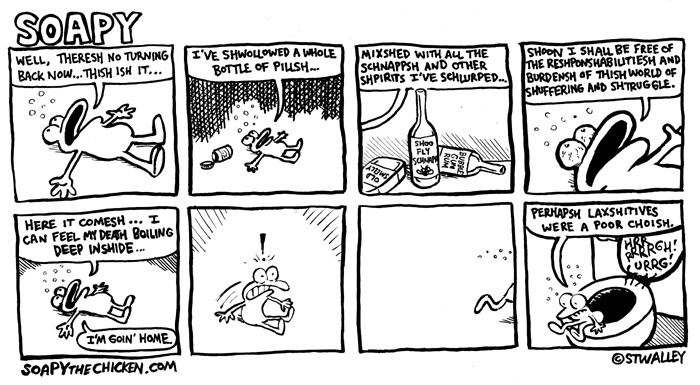 This is the cartoonist’s way. The International Cartoonist Conspiracy celebrates over 40 Minnesota cartoonists in a unique gallery show sequel entitled Lutefisk Sushi Vol B at Creative Electric Studios. The original Lutefisk Sushi Vol A show helped earn Creative Electric the City Pages’ Best Art Gallery of 2005, and Vol B promises to be even better. The box is bigger, for one thing. Each cartoonist will create a mini-comic of their work that will be collated into a limited edition hand-serigraphed bentobox-set sampler designed by political gadfly cartoonist Ken Avidor. The box will debut at the gallery opening March 24th, at 7pm. The boxes will probably sell out fast, so get there early if you want one. KEN AVIDOR, transit-obsessed, sensitive, tree-hugging environmentalist, political agitator and bicycle enthusiast is also KEN WEINER, former Screw art editor, party machine, devil may care ne’er-do-well and alcohol enthusiast. The Weiner Roast will feature a wide variety of work from Avidor/Weiner’s career and an exclusive 52 page comic honoring/roasting his work by 18 cartoonists from around the country including Pete Bagge, Dirty Danny Hellman, Mark Martin, and Big Time Attic. Lutefisk Sushi Volume B is a collaborative project of The International Cartoonist Conspiracy, Big Time Attic and Creative Electric Studios. I’ll be having some sort of contest soon to win a copy of the limited edition Soapy book, so you non-Minnesotans will have a chance to get a copy as well.